Shirley Curran, whose weekly and often very artistic blogs normally grace this site, is unable to blog this week’s Listener — for obvious reasons! — so asked me if I would be kind enough to cover for her. I owe her quite a lot, as a solver and perhaps even as a new regular setter, so I suppose it’s time I returned the favour. This isn’t my first blog for the site, and I hope you enjoyed (or at least weren’t too bored to death by) my solution to last time’s entertaining card puzzle. This is my first bash at a Word Listener so… here goes! Chalicea is becoming a regular setter for EV, Inquisitor and the Magpie, and also sets jointly as Rasputin, so that this is technically her second Listener after No. 4188 Painless (which was anything but for me! ), but first solo effort. I was promised “lots of thematic material” but “nothing too difficult”. Well, I’ll be the judge of that. So, to start with, reading the preamble led me to think that there might be some clashes somewhere. Not a promising start, I’m still a beginner so rely a bit too much on crossing answers to help me. Still, the first few clues came quickly, and after filling in 27d BRUSHES [(E+shrubs)*, graZes], 29d KIWI [kai -A about I, missing W], and 3d NEW LEFT [Net about (L + E + F)], I already had some idea that all the thematically missing letters were W’s, that the message revealed by corrections to misprints was going to be unusual, and very soon after that 27a was BLUESTOCKINGS. So that would suggest that the missing W’s are standing for Women? No women in University, perhaps, and maybe the two “clashing characters” were going to be arguing about that? Close but no cigar. Having entered BLUESTOCKINGS and with many of the clues around it, the grid was split into two pieces. I worked my way through the top half first, from right and then along to the left. 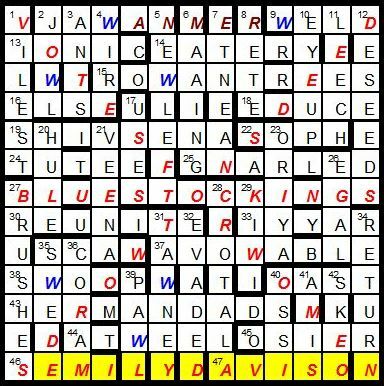 It took a while — I puzzled for some time over 12d (where’s that C fitting in?) before realising that it was “See” in De(e)ds for DESEEDS; and while 7d was ETNEAN [(Teen)* + An] the definition eluded me– must be a misprint, no idea what though (Cone, it turned out). Some of the missing W’s in the top half of the grid took a while to find — it was only towards the end of the grid that I cottoned on to the rule “put a W wherever possible” that would have helped a bit with JOWL and WELD. Time for a quick break… well, a long one, that geoguessr is very addictive. But Anyway the top half was finished, although I was surprised to have found only six of the misprints so far, with well over half the clues solved — but the bottom of the grid was empty, so they must all be lurking there. I didn’t really know where to begin yet, and I hadn’t ignored the bottom few clues entirely, but couldn’t seem to break into them. 28d for example, had to begin with CRO but I couldn’t finish it (CROTALA, cLackers [CoRn + o[u]t + à la]). Let’s glance around for those two phrases, maybe, that will help. Then I spotted “VOTES FO. W….” down the leading diagonal and a few seconds later in went VOTES FOR WOMEN and DEEDS NOT WORDS along the other diagonal, which would make a cross. My earlier internet research had led me to an 18th Century “Blue Stocking Society” so I was on the hunt for something completely different and about a century too early. Oh well. Finding the two phrases gave me enough to finally get a move on in the bottom half of the grid — and start finding those elusive misprints: 40d forMer not Forger for OSSI [crOSS-Indexing, hidden], 41d Mates not Rates and 42d ShEd not Shod (nor Shoe, as I tried for a few minutes!). So the misprints read “CHE..HEZ .. ..MME”. Hmm… oh, it’s CHERCHEZ LA FEMME, courtesy of Quinapalus. 36d held me up for a bit longer before I found CORAM [C/O + ram] with Ere instead of ire, and after that, there wasn’t much more left. Shirley Curran’s blog includes a hunt for the traditional Listener Setters’ tipple. So I was naturally on the lookout for her own reference in the clues. And was naturally surprised that I hadn’t found any yet. Surely she wouldn’t break her own rule? Oh no, there is it — the last clue, 31d TAWNEY which is defined as Port. How fitting that it should be my last clue. Finally it’s time to find that woman “clashing character” to be highlighted. Thankfully not too much grid-staring required, as there is Emily Davison sitting as the bottom of the grid, after throwing herself under the King’s Horse. So, what was that Horse’s name again? A quick search on Wikipedia to find that it was Anmer, found at the top of the grid of course. Final assessment? Certainly a lot of thematic material, to be sure. One, two, three, four, indeed five key words covering all over the grid, and as more Ws in a grid than you can shake a stick at. And, of course, a large and prominent Vote to complete the thematic content. And as to difficulty — well, a few clues were tough but they came at a fairly regular rate. Perhaps I was lucky to guess that all the missing letters would be Ws early on. By no means the toughest puzzle in the world but choc-full of the thematic material and some lovely clues. What a Listener should be. Thanks Chalicea. No wonderful artwork on offer this week, unless Chalicea provides some in a setters’ blog. Still, this image courtesy of my trusty Crossword Compiler is fairly colourful so maybe that will make up for it. This entry was posted on 21 June 2013 at 4:00 pm	and is filed under Solving Blogs. You can follow any responses to this entry through the RSS 2.0 feed. You can leave a response, or trackback from your own site. Clare Balding’s recent TV programme demonstrated quite convincingly that Emily Davison did not throw herself under the King’s horse – she was trying to attach a suffragette banner to the horse as a way of ‘communicating’ with the King. You’re probably right, but I figured this was a crossword blog rather than a history one. I’m fairly sure I reached that sort of conclusion years ago, although perhaps based on flawed reasoning, and didn’t really want to comment on anything beyond the crossword-y bit.